On May 15, 1913, the photographer Arthur Goss chronicled impoverished conditions in St. John’s Ward, including this photo, of a girl standing beside a tumbled down house with the old city hall in the background. The girl in the photo is facing the camera. She's wearing gloves, stout shoes and a long, button-up winter coat that reaches almost to her ankles. Her dark hair is tied back neatly. She may be dressed smartly, but she is surrounded by terrible poverty. There's a pile of scrap wood and a run-down outdoor toilet to her left. The stucco of the house behind her is falling off, exposing the wood frame. The window behind her is covered by sheets. Taken May 15, 1913, by Arthur Goss, the City of Toronto's first official photographer, the picture was part of a series examining living conditions in St. John's Ward, a densely populated and now largely vanished neighbourhood bordered by College, Queen and Yonge streets and University Avenue. Known simply as the Ward, it was home to about 11,000 people in 1913, many of them new immigrants living in crowded tenements and rented rooms. A large number of Ward properties lacked running water, heating and proper sanitation, but newcomers could often afford little else. Mr. Goss didn't record the girl's name, but her photo has since become well known. The juxtaposition of her surroundings with the towering, ornate presence of Old City Hall in the background tells a powerful story about struggle and inequality. If we could identify her, using details from the photo and its context, what else could we learn about the experience of newcomers to Canada in the early 20th century? With Charles Hastings, the city's medical officer of health, Mr. Goss systematically documented the poorest parts of Toronto in the 1910s. In 1911, the pair published a landmark report that stunned civic officials, who had long ignored the poverty on their doorstep. Taken in 1918, by Arthur Goss. The location may be Eaton’s parking lot. The team of horses may be clearing a site for a new building. "The people of Toronto are living in a fool's paradise," Mr. Hastings told the Toronto Daily Star. "It is a common saying that half the world does not know how the other half lives. The truth is that one half not only does not know but does not want to know." One type of housing Mr. Hastings singled out for criticism was "rear houses" – homes off the main street grid, accessible only by laneways. It was outside one of these that the girl in the winter coat was photographed. The day the picture was taken was unseasonably cold – about 6 C – and overcast. Mr. Goss's sequential numbering of his negatives tells us he probably visited in the morning. The girl actually appears in two photos – the one by herself and another at the rear of the same row of houses with a younger boy. Looking carefully, she appears to be about 10 or 11. The boy could be a brother. Judging by his height relative to her, he's about six or seven, which puts their years of birth at about 1903 and 1906, respectively. Fixing the girl's precise location on a fire insurance map of Toronto printed in 1913 yields the first clues to her identity. 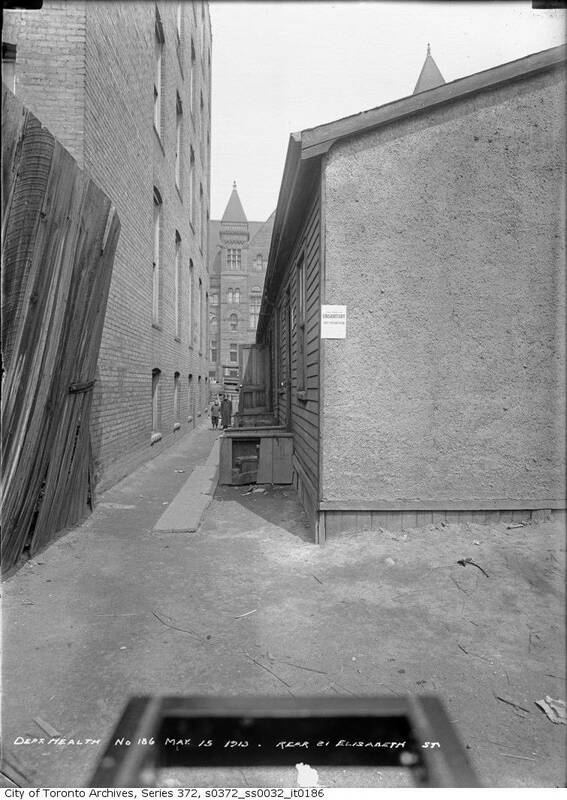 There was a row of three wood-framed rear houses on the block immediately west of Old City Hall that year. The girl is standing roughly in the middle of lot 33, which contained about seven other homes. The 1913 city directory unfortunately does not include the row of houses, because of their position off the street grid. Neither does the 1911 census of Elizabeth Street, conducted two years before Mr. Goss's picture was taken. But the 1914 tax assessment record (made in 1913) yields an exciting breakthrough. It lists three properties at the rear of 21 Elizabeth St. The first is inhabited by a Louis Rudneck, a 25-year-old tailor who is a little too young to have a 10-year-old daughter. Next door is peddler Moses Steinberg, 64, who is probably too old. The third house is occupied by Morris Cooperman, a clothing presser. The girl actually appears in two photos – the one by herself and another at the rear of the same row of houses with a younger boy, possibly a brother. He gives his age as 30, making him about 20 when the girl in the photo would have been born. Turning back to the 1911 census, the same Morris Cooperman is listed at the rear of 134 Centre Ave., which is now part of the Hospital for Sick Children site. Unlike the tax assessment, which only records the (often male) head of the household, the census provides a complete list of the people at each house. In 1911, Mr. Cooperman was accompanied on Centre Avenue by his wife, Bessie, and five children: Jennie, 11, Dora, 9, David, 4, Sarah, 2, and Ida, 1. All but the three youngest were born in Russia. They give their religion as Jewish. Dora – Dorothy – would have been 11 when Mr. Goss visited in 1913. David would have been six. Given their location and ages, these are almost certainly the children in the photographs. Looking again at the picture of Dora alone, a mother and child can be seen in the far background – Bessie with Sarah or Ida, perhaps. The life of Dorothy Cooperman suddenly comes into focus on the genealogy site Ancestry. A user related to the Coopermans through an in-law has sketched the key moments in Dorothy's life, from her birth in Kiev (then part of the Russian Empire) to her marriage, the births of her children and her death in 1979 in Oak Park, Mich., a suburb of Detroit. After the Goss photo, according to the user, the Coopermans left Canada. Dorothy married Louis Statfield in Wayne, Mich., in 1921. A daughter, Ethel, followed in 1922. They would e ventually have five kids together, one who passed away as recently as June, 2017. The trajectory of the Cooperman family mirrors that of many immigrants to North America in the 1900s: Struggle and hardship that slowly softens as the generations pass. Thousands of Jews like them migrated from Russia in the late 19th and early 20th centuries, fleeing anti-Semitic violence and poverty. In Toronto, Mr. Cooperman, like many others, found work in the garment industry, but clearly struggled to make ends meet for his young family. Perhaps he believed Detroit offered more opportunities. That Dora remained there the rest of her life is evidence of that. Goad’s Atlas of the City of Toronto from 1913. If we could magically fast forward through time, leaving the young Dora in her place in the photo, she would see the houses behind her quickly vanish – condemned and razed in the aftermath of Mr. Hastings and Mr. Goss's report. From 1914 to the late 1950s, she would find herself standing behind one of the largest vaudeville theatres in the world, Shea's Hippodrome. Maybe, if she listened carefully, she could hear performances by Buster Keaton, Stan Laurel or the Marx Brothers through the walls. The Hippodrome would come down with the rest of the block in 1956, replaced with a massive parking lot. A new City Hall would rise to her right, while the old one behind her would be threatened with and later saved from demolition. In 2018, she would find herself in the middle of Nathan Phillips Square. The rectangular reflecting pool follows almost exactly the boundaries of the city lot that contained the Coopermans' house. Left standing, their home would be under the pool's concrete arches, in the multicoloured glow of the Toronto sign, bathed in light.